I'm not sure if I should be more impressed that this Prince George's County criminal has successfully knocked over a string of banks without being caught or the fact that he had the balls to rob them while threatening to detonate a nuclear weapon. 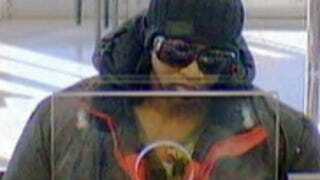 The Maryland-based thief has robbed four banks since December, the most recent occurring Monday. In all four incidents the suspect enters the branch, hands a teller a note demanding cash otherwise he will detonate a "nuclear weapon," and then flees on foot. He made it out of Monday's heist with an undisclosed amount of money. Now I'm not attempting to dismiss the terror a teller must feel when being held up but a "nuclear weapon"? Doesn't the complete and utter absurdity of such a threat just make you giggle a little? What's he going to do, obliterate himself too? I mean, the robber might as well as threaten a plague of frogs or claim that his Wookie sidekick is in the parking lot waiting to rip their arms off. For god's sake, at least point your index finger in your pocket and tell them you've got a gun—do something to earn that cash besides writing a note and running. I swear, nobody takes pride in their craft anymore.